I didn't list down my New Year's resolution for this year because truth be told, I will end up not doing most of them, if not all, anyway. It's not that I don't want to, it's just that the motivation and the discipline are not there. Having said that, it doesn't mean that I do not want to improve certain aspects of my life. I do. After all, I know that I'm soooo far from the perfect me that I REALLY want to achieve. And because of that, I've decided to create mini monthly goals for myself that I SHOULD fulfill at all cost. I thought, in this way, I can list down doable and not that hard to accomplish tasks that are realistic and of course, for self improvement. Now, in order to keep myself motivated, I have decided to include a reward and punishment system in the picture. Once I successfully crossed out all the items on my list, I will have a reward for myself. If not, I will of course, get punished. The monthly reward will most likely be little things that give me pleasure like I get a cheat day this week or I'll buy that book I've been wanting to have. As for the punishment, it's going to be taking away or delaying those simple pleasures I'm really dying to get my hands on like for the coming month, I am not allowed to have a cheat day so I won't be able to eat my favorite junk food or something like that. And come the end of this year, I'll check my progress and if I stayed on track at least 70% of the time, then that is the time I'll reward myself with something really big and special like a new gadget or a getaway trip or a shopping spree. And if I fail, I don't get the BIG reward. Since January is over and we're almost halfway of February already, what I've decided to do is to distribute that January point to March and April. If I successfully complete my March goals, I will earn one point plus another half point from the month of January giving me a total of 1.5 points. The same thing goes for the month of April (1.5 points) giving me a total of 4 points IF and ONLY IF I successfully achieve my February (1 point), March (1.5 points) and April (1.5 points) goals. So for this month, below are the goals that I've decided to accomplish. For the weekly tasks, I will have to start fulfilling them this week. About the reward, I've decided to start with something that may really sound simple to a lot of you (even to me actually) but is really hard for me since it's something that I look forward to having every weekend. So if succeed the February challenges, I can eat my favorite brownie sundae every weekend of March and buy one item from Flipkart! And if I fail, of course, no brownie sundae for the entire month of March and I am not allowed to buy any item unless it is a necessity. Oh dear! Wish me luck! I can do this! 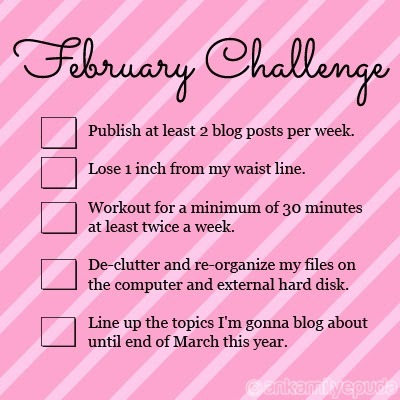 You can make your own monthly challenge too and I know you can do it as well!